John Talbot, the first Earl of Shewsbury (1388?-1453), was considered one of the most audacious of the English generals of his time. He went to France about 1419, was present at the sieges of Melun and Meaux. He fought at Verneuil, and was made a Knight of the Garter in 1424. In 1425 he became the King's lieutenant in Ireland. In March, 1427, Talbot accompanied Bedford to France. He was made captain of Pontorson, and we find him at the siege of Montargis which was raised by La Hire and Dunois. In March, 1428, John Talbot took Laval. He recovered Le Mans for the English. In December Bedford made him governor of Anjou and Maine and captain of release. At the siege of Orléans. he occupied the bastille of Saint Loup. After the siege was raised, Talbot drew back to Meting; then to Beaugency. 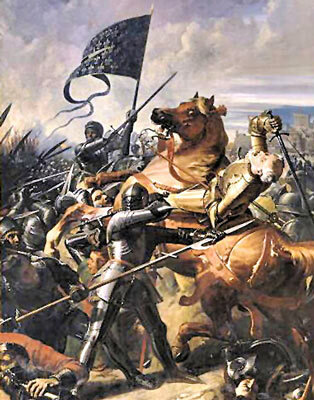 He was captured at Patay by the archers of Poton de Saintrailles and did not regain his liberty until 1433, Captain and governor of Rouen, he is to be found, in 1441, the King's lieutenant of lands between the Seine and the Somme; Marshal in France, and lieutenant of Aquitaine after the loss of Normandy, he perished heroically at Castillon in 1453. This model of chivalry and honor, Talbot, "watchdog of England," is portrayed in a miniature in the Shrewsbury Book.